America's Growing Taste For Mezcal Is Good For Mexico's Small Producers : The Salt Oaxaca is the heart of mezcal country, where the pungent booze is made from the same plant as tequila by traditional distillers. 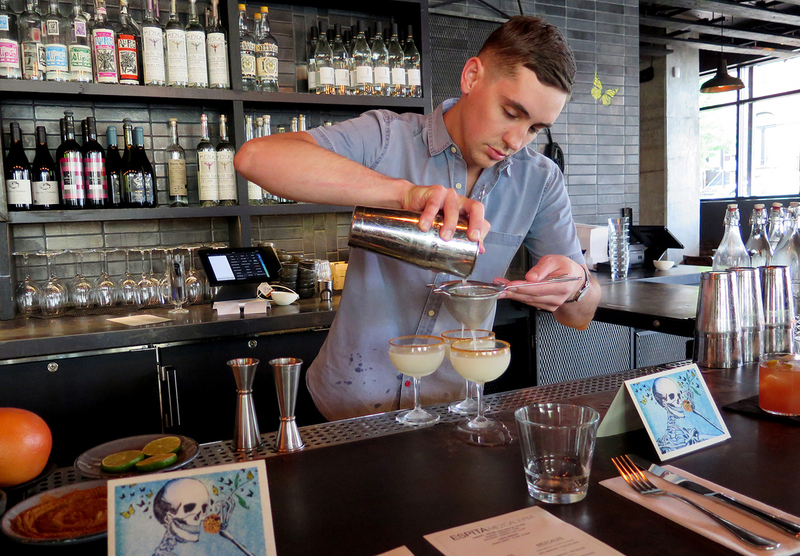 As U.S. drinkers embrace mezcal, investors are flocking south. Bartender Robin Miller mixes a round of mezcal margaritas at Espita Mezcaleria in Washington, D.C. As U.S. drinkers embrace mezcal, investors are flocking south to the heart of Mexico's mezcal country, and local incomes are rising. A traditional drink is giving a boost to the economy of one of the poorest states in Mexico. It's called mezcal, a pungent booze made from the agave plant — the same plant used to make Mexico's biggest spirit export, tequila. Investors north of the border are taking notice of Mezcal's newfound popularity and are flocking to the southern state of Oaxaca, its main production hub. The heart of mezcal country is in Oaxaca's central valley. Small, traditional producers distill the spirit alongside their crops and farm animals. Mezcal is prepared in distilleries called palenques, barn-like structures where the agave plant's thick, tall leaves are shaved with machetes and crushed. The sweet extract juices are then distilled into the smoky, clear alcohol. Demand for mezcal is growing. Last year it was Mexico's third-largest alcoholic export, behind beer and tequila, generating more than $26 million, according to the Mexican government. And foreigners aren't just drinking up mezcal — they're also flocking to Oaxaca to see how the spirit is made up close and personal. Canadian Alvin Starkman moved to Oaxaca over a decade ago and began giving tours of mezcal country — in small towns like Santa Catarina Minas, San Baltazar Chicicapan and Santiago Matatlán, the town self-proclaimed as "The World Capital of Mezcal." Starkman likens many of the tourists he shuttles around to pilgrims – "people making a pilgrimage to come to Oaxaca to learn about their new favorite drink, even though the history of mezcal goes back 450 years, if not to pre-Hispanic times." But lately, Starkman says he's noticed a different kind of visitor on his tours: "At least once a month, I am taking out somebody who wants to export mezcal to the United States or England or Australia or Germany." Thomas Kalnik from Boston is enjoying the tour. He founded Peñasco, an alcohol-importing company. "We are focused on importing artisanal mezcal for distribution in the U.S. market," he says. And he likes what he sees — especially the high prices some mezcal is fetching these days. Some bottles go for as much as $200 in higher-end stores and bars. With two-thirds of Mexico's mezcal exports going to the U.S., Mexican authorities and producers are regularly traveling north to hunt for capital. "The truth is, for us it's a great source of support," Hipócrates Nolasco, president of the National Council of Mezcal, says in Spanish. Without the new foreign investment, he says there would be no boom. And according to officials in Oaxaca, that new money is boosting local incomes. It's even attracting migrants who had left Mexico for work in the U.S. to come back to Oaxaca. That includes people like Rigo Cruz, who just returned from living in Los Angeles for the past 12 years, where he worked in a bar. "I think it's better here," Cruz says. He's glad to be back home and working in his family's mezcal business. When he left Oaxaca all those years ago to find work in California, the business wasn't making enough money to support everyone. Now the family is distilling 2,400 bottles a month. Cruz says he hopes he can help his parents grow that number even higher. "We just have to meet more people, learn more about mezcal and do something big," he says. Oaxacan officials are hoping for the same. They're hosting an international mezcal fair next month in the state capital and a business summit of distilleries from around the world in August.